Mechanical behavior. Stress versus strain. Elastic deformation. The basic description of the material is obtained by the tensile test. Fig. 1. Illustrates this simple pull test. where P is the load on the sample with an original (zero stress) cross-sectional area, A0. Sample cross section refers to the region near the center of the specimen’s length. Fig. 2. 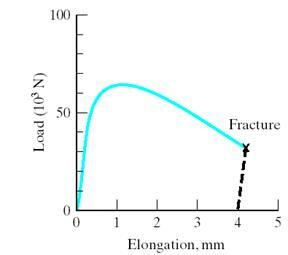 Load-versus-elongation curve obtained in a tensile test. The specimen was Al-2084-T81. where l is the gage length at a given load, and lo is the original (zero-stress) length. Fig.3 is divided into 2 distinct regions: 1) elastic deformation; 2) plastic deformation. Elastic deformation is temporary deformation. It is fully recovered when the load is removed. 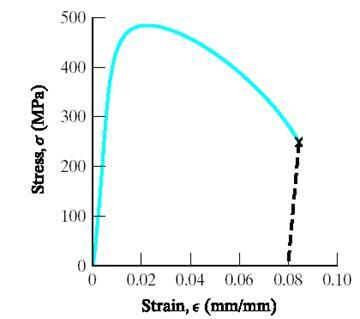 The elastic region of the stress-strain curve is the initial linear portion. Plastic deformation is permanent deformation. It is not recovered when the load is removed, although a small elastic component is recovered. The plastic region is the nonlinear portion generated once the total strain exceeds its elastic limit. It is often difficult to specify precisely the point at which the stress-strain curve deviates from linearity and enters the plastic region. Fig. 3. Stress-versus-strain curve obtained by normalizing the data for specimen geometry. The modulus E is a highly practical piece of information. It represents the stiffness of the material that is its resistance to elastic strain. This manifests itself as the amount of deformation in normal use below the yield strength and the springiness of the material during forming. As with E, the yield strength has major practical significance. It shows the resistance of the metal to permanent deformation and indicates rolling and drawing operations can form the ease with the metal. 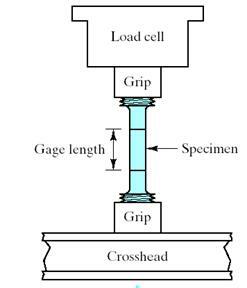 Although we are concentrating on the behavior of metals under tensile loads, the testing apparatus illustrated in Fig.1 is routinely used in a reversed mode producing a compressive test. The elastic modulus in fact, tends to be the same for metal alloys tested in either tensile or compressive modes. 1) Many design engineers, especially in the aerospace field, are more interested in strength-per-unit density than strength or density individually (If 2 alloys each have adequate strength, the lower density one is preferred for potential fuel savings). 2) The strength-per-unit density is generally termined specific strength, or strength-to-weight ratio, and is discussed relative to composite properties later. 3) Another term of practical engineering importance is residual stress, defined as the stress remaining within a structural material after all applied loads are removed. This commonly occurs following various thermo mechanical treatment such as welding and machining.